Now is a great time to consider a career as a code professional. A generation of code professionals is retiring and a new generation is needed to replace their valuable role to champion building safety in our community. Code professionals play a major role to ensure buildings are constructed in accordance with the codes. Codes address structural stability, fire safety, adequate means of egress (exits), sanitation, safe wiring and more. Code professionals protect the public health, safety and welfare through effective code enforcement of the built environment. Employment opportunities are available in both the private and public sectors. Code professionals work in a variety of settings, both indoor and outside. Some positions may require a college education, whereas other positions may not require advanced degrees. Earnings are higher than those of many other industries. Salaries depend on experience, education, location and actual job requirements, and can range from approximately $25,850 to $97,000. Benefits often include paid vacations and holidays, sick leave, medical and life insurance and some form of retirement or pension program. I hope the information provided on this page is helpful and informative as you consider a career in the codes. Please contact the Southern Nevada Chapter of the International Code Council at CareersInCodes@gmail.com for more information; a local code professional will reply to you. Click here for International Code Council “Careers in Code Enforcement” article. Click here for International Code Council “Careers in Code Enforcement” brochure. Click here for International Code Council “Careers in Code Administration” brochure. 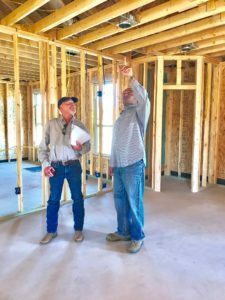 Click here for “The Job of a Construction or Building Inspector” article. Click here for “The Job of a Plan Examiner” article. Click here for “The Job of an Engineer” article. Click here for SN-ICC Scholarship Information Flyer. Click here for College of Southern NV class information. Copyright © 2016 - 2019 Southern Nevada Chapter of the International Code Council. All rights reserved.